On a small island, just west of the coast of Africa, two Peace Corps volunteers are providing the opportunity to have books available for primary age children as well as adults. Adam Kendis and his wife Jen Epstein will spend two years on the island of Santiago. 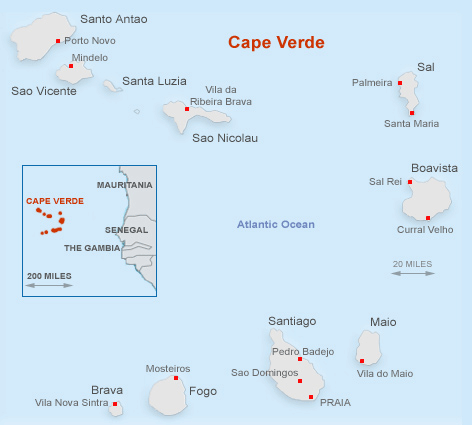 There is a high illiteracy rate in Cape Verde, partly because the people speak “Kriolu” in their everyday life and it is a spoken language only. The language in schools is Portuguese, and students struggle to read and understand very basic sentences in that language. Adam and Jen will soon be receiving a box of books from Books for Life, which will be useful in working with adults in the community who speak various levels of English as well as introducing the experience of reading for fun to children. This dedicated couple would also like to get books printed in the “Kriolu” language before they end their term of Peace Corps service in Sept 2013. Perhaps Books for Life can help with that as well! Where this is reading, education happens. This entry was posted on February 1, 2012 at 3:51 am and is filed under Uncategorized. You can follow any responses to this entry through the RSS 2.0 feed. You can leave a response, or trackback from your own site. I love the last three-line phrase, who’s it by? I would like to share it. Thanks and keep the great work! This has been a Books for Life byline for many years. Feel free to share. Should you start a project, keep us posted on your progress. Thank you very much! I will. This publication is totally, utterly, completely, absolutely, concretely and without-a-doubt copyright free. Share it freely with people who can make a difference! Esta publicación es totalmente, completamente, absolutamente, concretamente y sin ninguna duda libre de derechos de autor. ¡Compártalo con la gente que puede hacer una diferencia! Keep up your great work in Paraguay. Please stay in touch. How wonderful to see that people are inspired by the work of Books for Life in Santiago in the Cape Verde Islands! Books for Life is a wonderful organization. I volunteered for Trees for Life, their partner organization, several years ago and fell in love with their workers and mission. Everyone there is so giving and caring. Many blessings to Adam and Jen as they work to bring literacy to the children of Santiago. Congratulations for working with Books for Life!